Having VIP passes for Wizard World meant that we could enter the exhibit hall 30 minutes earlier than the normal general admission folks on Saturday and Sunday. I didn’t realize how advantageous that would be when we made the purchase, but we did enter earlier than the general admission folks both days, and it was a good thing. On Saturday, after a couple of laps through the exhibit hall, we eventually ended up second in line for Julie Benz’s autograph. She was a few minutes late to arrive but we were able to get her autograph and get upstairs and get a great spot for her 30 minute panel discussion that started the day in Ballroom 203, the Sacramento very small answer to San Diego’s Hall H. The panel was short and Julie didn’t really have any remarkable stories to share, but it was good to see her in conversation. 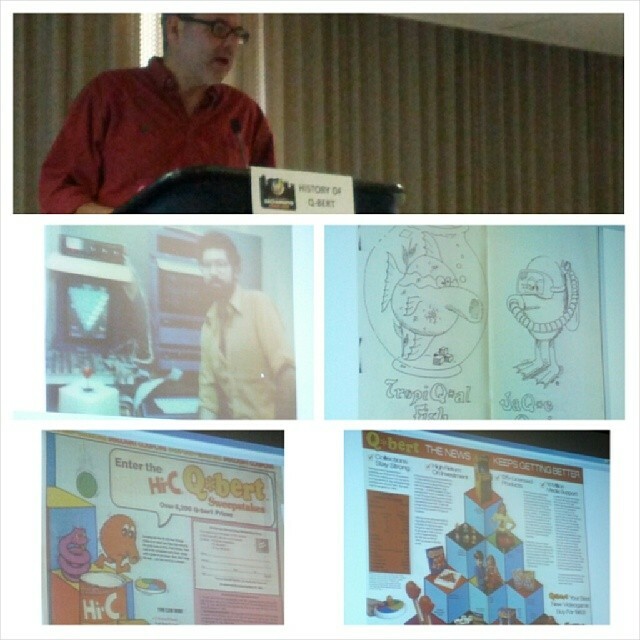 We went to Warren Davis’s second panel after the Julie Benz panel, a informative discussion about the history of Q*Bert. It was basically this article but in person with more photos. After the Q*Bert panel, we headed across the street to the Hyatt, where additional programming very few people attended was taking place. We ate lunch, sandwiches we had grabbed from Starbucks on the way to the convention center, in the hallway of the second floor of the Hyatt. It was a quiet location just seconds away from the hustle and bustle from the convention. It also would have cost us a couple hundred more dollars a night to stay there than the Holiday Inn about 3/4 of a mile down K Street. After lunch, we decided to do our photo op with Julie Benz. We had options of either Saturday or Sunday and with a reshuffling of the convention programming to accommodate Stan Lee arriving two days late due to a battle with the flu, we thought it best to get it over with on Saturday. While in line, I was ranked in the top 50 Ingress players for the region for the first time, mainly because Sacramento seems to be a really inactive region. So even though I only played down K Street to the convention center, I was ranked #44. As typical, we spent a few seconds standing next to each other with the flash bulb going off. Julie said “Hi again” to us having recognized us from earlier in the day. I thought the photo turned out well, but my wife doesn’t like how her hair looks in it. After that, we headed upstairs to a mostly empty Ballroom 203. There was an hour of time that was originally blocked for Stan Lee but was vacant due to him not arriving until Sunday. We got a good spot for the remainder of the programming and settled in. James Marsters was up next. He always delivers quality panel discussions. In this one he also plugged a concert that his band Ghost of the Robot was performing a few blocks toward our hotel down K Street at Assembly. We bought tickets to the show during the panel. Up next was William Shatner, a man whose responses to questions drips with sarcasm and wit and kept me laughing for almost the entire forty minute panel. The man that followed Shatner had a lot of work cut out for him. Instead, Bruce Campbell invited audience members, three at a time, in two groups, to be the panel. One panelist was a professional action figure reviewer. Another was a female marine veteran. The third for the first group was just a big Evil Dead fan. None of them were terribly interesting. The second group, consisting of a Repo! shadow cast member that once played Chuck E Cheese, a Texas student who played Ash in Evil Dead the Musical, and a ten year old boy who is a huge fan of The Walking Dead was far more entertaining. The highlight of the whole panel was when the 10 year old and Bruce had the following exchange: Bruce Campbell: “Why do you like shows about dead people? Were you happy when Michael Rooker died?” The ten year old: “I just saw him today.” Something just kind of felt missing in that last panel. But the ten year old made it a lot more entertaining than it would have been without him. We picked up our Julie Benz photo and ate a quick slice of pizza at Thee Upper Crust again before heading over to Assembly for Ghost of the Robot. In line out front, there was a random Jesus Freak preaching and singing hymns of some form in front of the Crest Theater which was screening Jewish Film Festival flicks. No idea why the guy chose there to preach but to each their own and he provided quality entertainment while we waited for doors to open. My phone, the sole place the tickets were located, decided that the ROM wasn’t happy right before doors opened. Thankfully I got i sorted before we went in. The opening act, Maxxx, was a local Sacramento heavy metal band who claim to be a modern day version of Spinal Tap. They reminded me a lot of Motley Crue, but with an added keytar. They weren’t great, but they weren’t as bad as their bio described them to be. Sadly, Ghost of the Robot just weren’t our thing. We stayed for their set which rotated vocals between Marsters, his son Sullivan and bandmate Charlie De Mars. It had a mix of rock and blues and just felt disjointed with the songs not grabbing me at all. When we left, we headed back to our hotel and then headed right back past Assembly for a late lasagne dinner at Pizza Rock. We retired to our hotel bed just before we lost an hour due to Daylight Saving Time.